The human body has evolved to walk, stand and run with great agility. It’s not designed to stay in a sitting position for 8 or more hours at a stretch, and yet this is what many of us now do as part of our jobs. If you spend most of your work day sitting, it’s important to take steps to keep your body – especially your spine – in good shape. One of the most important steps is making sure you have an appropriate office chair. First and foremost, you need proper support of the lumbar region of your back. This is the part of your back that curves slightly inward. Without lumbar support, the natural “s” shape of the spine becomes stretched out into a less supportive “c” shape. If your chair doesn’t have a support for this part of your back, it’s time to get a new office chair. The armrests on an office chair should allow your arms to sit at 90-degree angles to your body, parallel to the surface you’re working on. This makes it unnecessary for your wrists to be at an artificial angle and will help prevent repetitive strain injuries (RSIs) such as carpal tunnel syndrome. The best chairs have adjustable armrests so you can use them at desks of any height. When you arrive at your desk, it’s frustrating if your chair has wheels that slip and slide like old shopping trolleys, or ones that don’t move at all, forcing you to huff and puff to get comfortable. Your office chair should have well-oiled and unobstructed wheels so that you can slide in and out of your desk with minimal effort. Your office chair should be at a height that allows your feet to reach the ground comfortably. If they’re dangling or you’re forced to prop your feet up on the base of the chair, it’s likely that you’re putting unnecessary strain on your knees and joints. You may have had this problem for so long that you’ve begun not to notice it, but even the slightest amount of wobble in your seat’s base might be putting extra strain on your back, forcing you to lean slightly to the left or the right throughout the day. It’s important to ensure that the seat on your office chair is completely stable. You shouldn’t suffer from a case of “numb bum” at the end of a work day. This is a sign that your circulation is being cut off, which may eventually lead to serious problems. Make sure that your office chair has high-quality, plump cushioning so that your back, derrière and thighs are comfortable all day long. Over time and with constant use, the upholstery on your office chair is likely to get dirty and worn. When this happens, it’s time to have the chair professionally cleaned, re-upholstered or replaced. The depth of your office chair should be such that you can easily fit a fist between the back of your calves and the front edge of the base. If this isn’t possible, it’s likely that you’re cutting off circulation to your lower legs. An office chair should have a tilting mechanism, and preferably one that’s adjustable so that it reacts according to your weight. A tilting mechanism is essential because it helps to distribute your weight, alleviating overall strain. 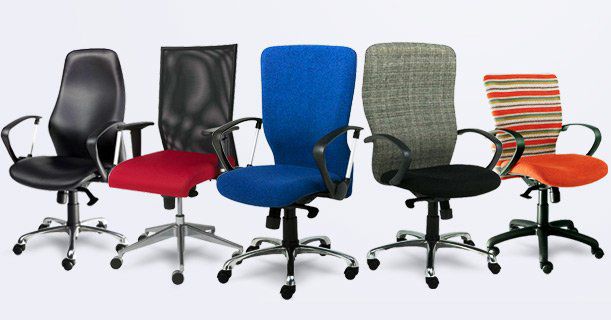 Your office chair should have a swivel mechanism, allowing you to spin in different directions. This alleviates the risk of straining your back by twisting or turning after hours of having your spine in the same position.